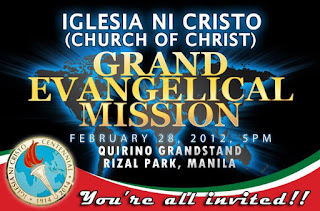 Iglesia Ni Cristo brethren and guests will gather at the Quirino Grandstand, Luneta, Manila 5:00 pm tomorrow for a Grand Evangelical Mission. This is a nationwide event to be held on big venues in different parts of the Philippines. It is expected that guests coming from Ecclesiastical District of Laguna, Quezon Province, Batangas, Cavite, Rizal and Metropolitan Manila will occupy most of the Luneta Park up to Taft Avenue tomorrow. 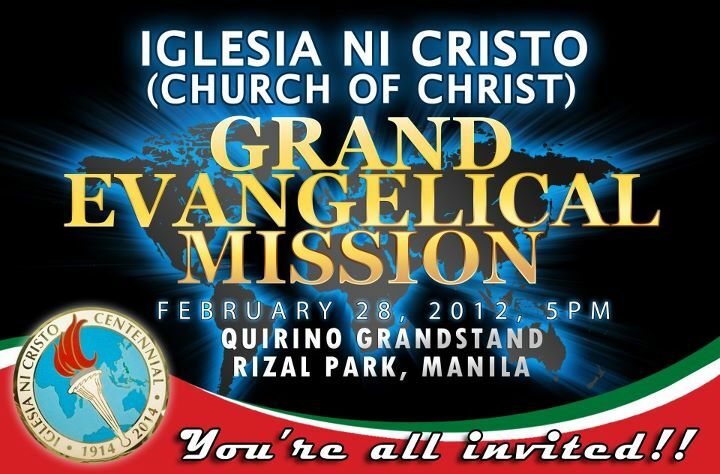 I am inviting you, my friends who are not yet members of Iglesia Ni Cristo to attend this Bible Exposition. We are pleased to invite you to hear God's teachings based on the Holy Bible, hymn signing and prayers in this special gathering. You really have a very entertaining blog!! Keep it going! Hi Jen! thanks for visiting my blog. Thanks for those kinds words. I'm glad to meet a fellow Iglesia Ni Cristo member who blogs, too..